To hold my planters I pulled out a folding tray table and lined it with a plastic bag to protect it. At least moisture wouldn’t be able to damage the table during these plant’s stint inside. I covered the plastic with an old towel to hide the lining. But like I said, those red plastic coffee can planters are too ugly to be in the house. And this is our guest bedroom! I really hated the look. Maybe I can disguise it a little to make it presentable? So I wrapped the whole group of them all in a single piece of burlap scrap to hide the coffee cans & tone down the glare of bright-red plastic. Then I dropped pinecones, driftwood, etc in the empty spaces between the cans to hide the gaps. It gave the appearance of being a single planter. I think it looks much better! Burlap fits perfectly with my decor, it’s temporary and costs nothing. 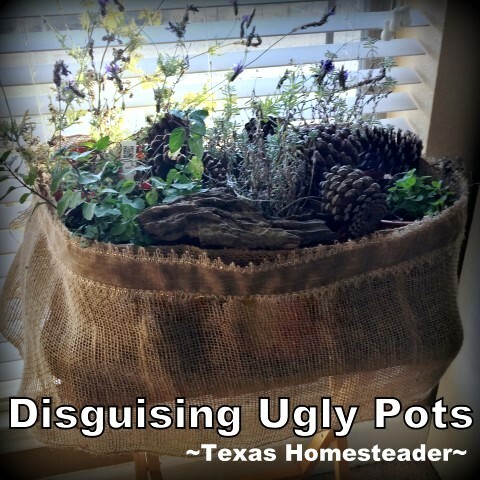 When it’s time to take these plants back outside I’ll just roll up the burlap & drop the red planters back into their large, more decorative outside pots. Every time I read something that you use those containers for it makes me wish I drank coffee. I do have a friend that is a huge coffee drinker and will see if I can get a few from her. I forgot to ask, did you get that book? I don’t drink the kind of coffee that comes in the hard to throw away red plastic cans any more but I have a stash of them in the basement from when I did. Not that my coffee delivery system container is a whole lot better for the universe but like you have said, we all do what we can and remember 1 plastic bottle and 76 billion of them. Dang, I have to think of a way to reuse more of those coffee containers at my house. I remember in the old days weaving things our of a variety of materials, maybe I could do something with them and make them into a back door mat. The windows are in the barn, the “boys” are working on the siding. We got key pad door locks for 2 of the 3 man doors yesterday and more wire so that “we” can put in an outdoor outlet and light. Gads the stuff that the men in my life can do. I need to remember to be more appreciative of all the stuff “birdman” does around here. Patti – take special care of yourself with the flu rampaging around and from all I hear it’s a bad one this year.